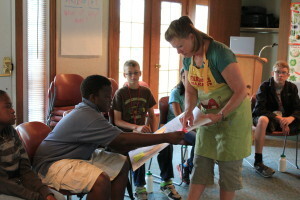 Today was the first day of camp and we learned about community food systems! 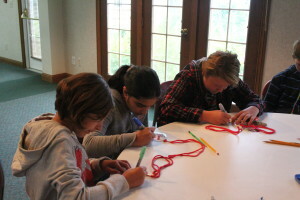 We started the day by creating our brand on our nametags by drawing pictures and words that describe us. Some of us also worked on a community food system poster that described the cycle from farm to distribution. 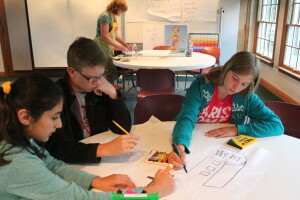 Campers work on their personal brand. The community food system poster shows all the parts of the process. Then we toured the farm to see where we might want to put our farm stands on Friday. We went to the gardens also to see what types of things we might sell. 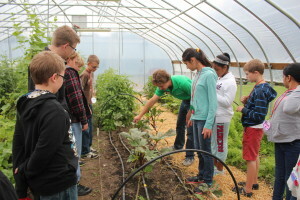 Campers check out the hoop house. Ms. Kathe brought bags of veggies for us to play a fun icebreaker. We had to use our sense of smell and touch to figure out what type of veggie was in the bag. 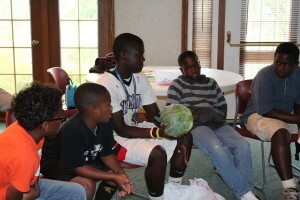 A camper discovers cabbage in his bag. After we figured out our veggies we talked a little about how they grow. We used to chart to identify the parts of plants and which parts are edible on certain plants. A camper sticks his identification card on the poster. Now that we had talked about the produce it was on to learning some business basics. Mr. Alan started off by having everyone explain what they thought an entrepreneur is. Together we decided an entrepreneur was someone who takes a risk for a reward. 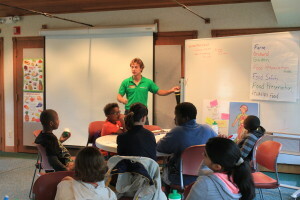 We also learned that for a business you need capital resources, natural resources, and human resources to be successful. Mr. Alan writes down everyone’s ideas about entrepreneurs and business. We went on a hayride to tour more of the property and take a walk through the woods. While we walked through the woods we talked about why having a forest could be a profitable business and some ways you can use the forest. 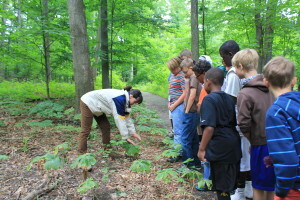 Ms. Mandy even showed us some edible plants in the forest. Ms. Mandy shows us the may apple plant. After our hayride was time to make some value added products for our stands. Today we made strawberry and gooseberry jam. Gooseberries look almost like grapes but with stems on the top and bottom that needed to be picked off before being made into jam. 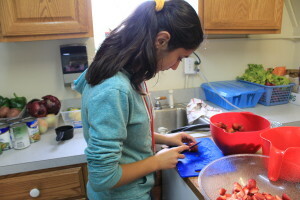 Grace cuts up the strawberries. 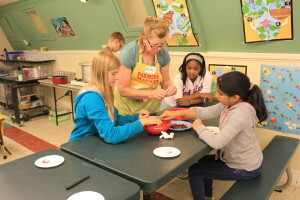 Another group had the tedious task of removing the gooseberry stems. After the berries were cut and destemmed then we chopped and mashed them before we cooked them. We measured out the sugar and pectin for each batch of berries. 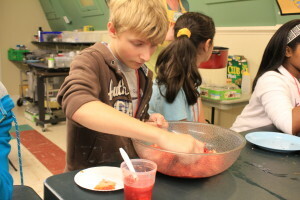 Liam chops up the strawberries. 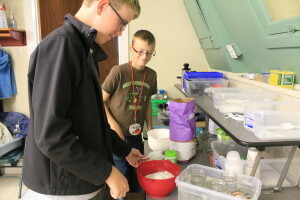 Trevor and Jonathan measured out the pectin and sugar. 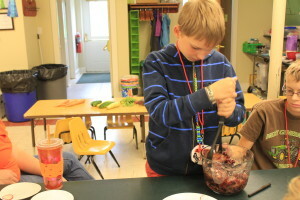 Aaron mashed the gooseberries to prepare them to cook. While we waited on our jams to be done we tried many different types of vegetables, including eggplant, kohlrabi, and zucchini. Our jam we made today will be sold on Friday at our farm stands so make sure you come check it out! Don’t forget we are going to Eastern Market tomorrow and wear your t-shirt!